Congratulations to Madelyn Knight. 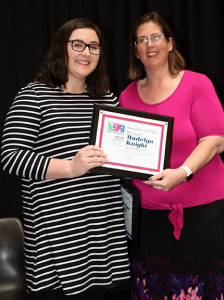 On March 14th, Madelyn was recognized as the top Journalist in the State. One of four finalists from across the state, contest judges selected Knight’s comprehensive portfolio because it not only showcased her talents within the field, but also highlighted the progression of a lifelong learner dedicated to the craft and her peers.